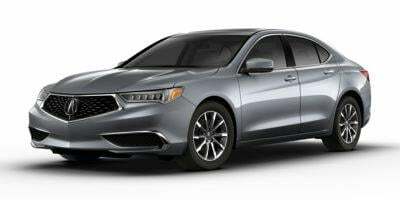 Be the first to review this 2019 Acura TLX. Though short on the swagger that identifies some luxury-sedan rivals, the mid-size Acura TLX doesn’t hold back on premium features. Acura’s TLX shuns conventional trim levels. Offered with either 4-cylinder (2.4L) or V-6 (3.5L) power, it comes in base form or can incorporate one of several option packages. The 2.4-liter 4-cylinder engine makes 206 horsepower and 182 pound-feet of torque. Front-wheel drive, coupled with four-wheel steering, is the sole configuration with this engine. An 8-speed automatic transmission with paddle shifters is standard for 4-cylinder models. All-wheel drive is standard with 3.5-liter V-6 models, rated at 290 horsepower and 267 pound-feet. With the V-6, a 9-speed automatic takes over, also fitted with paddles. A-Spec trim is now available for 4-cylinder TLX models, as well as with the V-6. Exclusive design features give the A-Spec edition a sportier appearance. In addition to a blacked-out grille and more assertive bodywork, each A-Spec variant comes with LED fog lights. Pushing the "dark-mode" theme further yet, the 19-inch wheels are painted Shark Gray, LED taillight covers are tinted, and a gloss-black spoiler sits atop the decklid. Every TLX boasts a comprehensive bundle of standard features and advanced technology, aimed at making driving more intuitive as well as comfortable. Specifically, each TLX is fitted with adaptive cruise control and active lane assist. Automatic emergency braking is complemented by forward collision warnings. Base models may be fitted with blind-spot monitors with rear cross-traffic alerts. A-Spec versions make that safety feature standard. Crash-test scores are impressive, too. Federal testers for the National Highway Traffic Safety Administration gave the 2019 Acura TLX the top five-star rating overall, as well as for frontal and side impacts. The sedan even earned a five-star score for rollover prevention, which is a calculated figure. Testing by the Insurance Institute for Highway Safety yielded mostly admirable results, led by “Good” ratings for moderate-overlap and side-impact crashes. In the more stringent small-overlap crash-test, the driver’s side was judged “Acceptable.” No rating was supplied for the passenger side. The base 2.4L ($33,000) has front-wheel drive, the 2.4-liter 4-cylinder engine, 8-speed automatic, a moonroof, LED headlights, heated power front seats, keyless start, dual-zone automatic climate control with air filtration, synthetic leather seat upholstery, Bluetooth, Apple CarPlay/Android Auto integration, and 17-inch wheels. Adaptive cruise control and parking sensors are included. The 2.4L w/Technology Package ($36,700) adds blind-spot monitors. The 2.4L w/A-Spec Package ($39,400) boasts a selection of sporty body modifications with blacked-out details. The 2.4L FWD w/A-Spec Package and Red Leather ($39,400) substitutes red leather upholstery. The 3.5L ($36,200 with front-drive, $38,200 with all-wheel drive) substitutes the 3.5-liter V-6 engine. The 3.5L w/Technology Package ($40,100 with FWD, $42,100 with AWD) adds contents of the Technology group. The 3.5L w/A-Spec Package ($42,800 with FWD, $44,800 with AWD) adds A-Spec contents, similar to 4-cylinder model. The 3.5L w/A-Spec Package and Red Leather ($42,800 with FWD, $44,800 with AWD) adds red leather upholstery to the A-Spec option group. The 3.5L w/Advance Package ($43,950 with FWD, $45,950 with AWD) comes with premium leather-trimmed upholstery, heated and cooled front seats, heated rear seats, navigation, and traffic assist. Muted styling keeps the TLX on the tasteful side of sedans. Modifications made for 2018 included a new grille flanked by bigger, reshaped LED headlights and exhaust tips, which give the TLX a clean and understated look. A-Spec models take the dual-exhaust system a step further, mounting a pair of eye-catching 4-inch exhaust tips below tinted taillights. Compared to German-brand rivals, at least, the TLX retains a somewhat snug cabin. On the plus side, it’s attractive and refined. Upper trim levels add contrast stitching and piping to their leather-upholstered seats. Ambient lighting helps the cabin feel modern, if somewhat tame. Wide and amply-cushioned, the TLX’s front seats provide sufficient support when roads turn curvy. A-Spec models add heavier bolstering for a sportier, even more supportive feel. Trunk space totals 14.3 cubic feet. Though effectively quick and responsive to touch-type inputs, Acura’s dual-screen infotainment system takes time to learn. Apple CarPlay and Android Auto compatibility is a welcome feature. In its current form, Acura’s TLX earns credit for a strong V-6 engine, sporty A-Spec trim, and the available Super-Handling All-Wheel Drive system. Even though A-Spec modifications affect appearance rather than performance, that option adds to the mid-size sedan’s overall appeal. Sporty aspirations aside, the TLX carries on as a capable highway cruiser, agreeably traversing the narrow barrier between ride comfort and driving dynamics. Acceleration with the V-6 is strong from a stop, with abundant thrust at hand for passing on two-lane roads, though the 9-speed automatic sometimes hunts for gears. Performance with the 206-horsepower 4-cylinder engine isn’t far behind, though, and its 8-speed dual-clutch gearbox mates well with it. A-Spec models emit a throatier intake sound than other TLX sedans. On almost any road surface, the TLX delivers a smooth, refined, comfortably quiet ride. As for handling, sedans with V-6 power benefit from quicker steering and stiffer springs. Optional all-wheel drive keeps the TLX under closer control when cornering. Fuel economy is decent. The 4-cylinder TLX is EPA-rated at 23/33 mpg City/Highway, or 27 mpg Combined. Front-drive V-6 models are EPA-rated at 20/31/24 mpg. All-wheel drive dips the V-6 estimate to 20/29/23 mpg. Benefitting from an impressive list of standard features, the 2019 Acura TLX offers a milder flavor of luxury than its German rivals. The best value may be the 4-cylinder model with Technology Package, with its navigation, upgraded audio, and bountiful driver-assistance technologies.